Today, we work with a question. Is something worrying you at work? At college? At home? Are you trying to push for an answer for something coming up for you in the near future? Find a way to turn this into a short and concise question you can carry with you for the day. 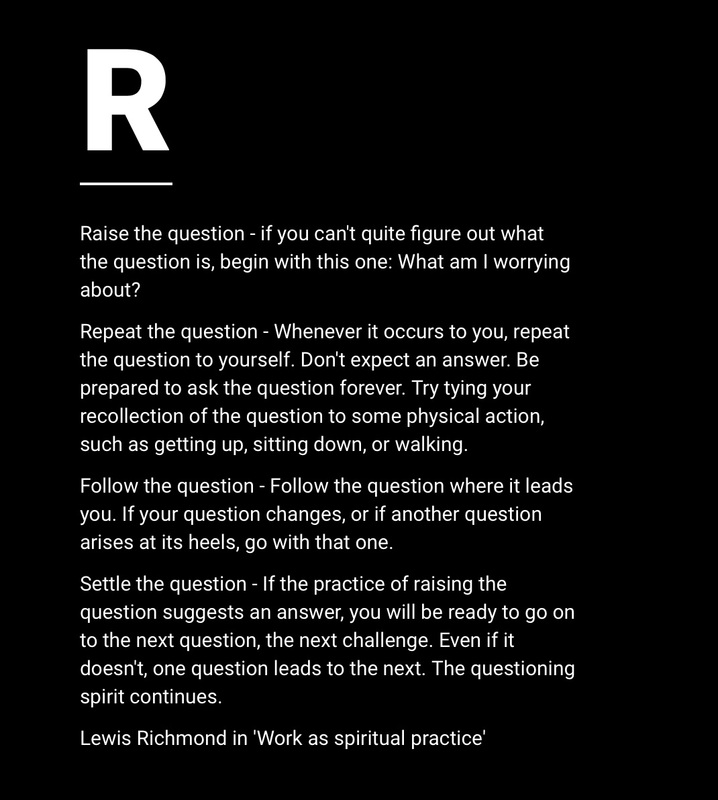 Use your question today to develop a practice of working with questions in life, everyday. Richmond reminds us: ‘Either the question resolves itself into some kind of answer, or else it subsides and dies away. If an answer comes, that’s good! But if the question dies away, if over time you forget about it, that’s all right too.” Enjoy raising your question today and notice how it helps clear the mind from seeking answers that may just need emerge over time. His book ‘Work as a spiritual practice’ is always worth revisiting.